If more metal is what you need, you've come to the right place. 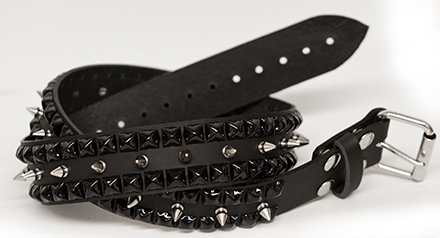 This rockin' pyramid studded and spiked belt is a belt for life! The top and bottom rows are black pyramid studs and the center row is 1/2" spikes. Unlike those disposable cheapo bonded leather belts from places like Hot Topic with their short life and quality, these belts are handmade especially for us from thick 100% Black Leather and will last as long as you do! They're 1-3/4" thick and are made with detachable buckles so you can customize 'em. *NOTE: Please add 3"-4" to your waist size when ordering to account for clothing thickness* (for example, if your waist is 34", then 34" + 4" = 38", so order a size Large belt.) S=27-35", M=30-38", L=34-42", XL=39-47", XXL=41-49"